In today’s interview I get to speak with, Luis Villasenor, Ketogains founder and amateur bodybuilder, on how to build muscle and stay lean using an evidence-based ketogenic diet approach. Luis is very passionate about fitness and nutrition. Starting in his teens, when he first began his journey to find a way to build muscle without the bulk, he deep dived into the science behind nutrition and strength training. With years of experience behind him, today, he is one of the go-to experts when it comes to the ketogenic diet and bodybuilding. In today’s interview, we get a chance to talk about how to formulate our diet and our fitness regime to meet specific health goals in an optimal way. If you know someone who is interested in the best ways to strength train and build muscle on a ketogenic diet, this interview is for them. I enjoyed this interview and learned a lot from Luis about how we can optimise our low-carb/ketogenic diet for muscle gain. He shared some great tips about the main things to focus on and dispelled some commonly held misconceptions; we don’t need carbs to grow muscle and we shouldn’t be afraid of protein and gluconeogenesis. Special thanks to Luis for joining me on the show. Enjoy the episode! For more information or to follow Luis Villasenor on Twitter or Instagram, or visit the Ketogains website or Facebook page. [00:19] – Introducing, Luis Villasenor (also known as darthluiggi) the founder of Ketogains; a community-driven exploration into the pursuit of physical excellence via ketosis. 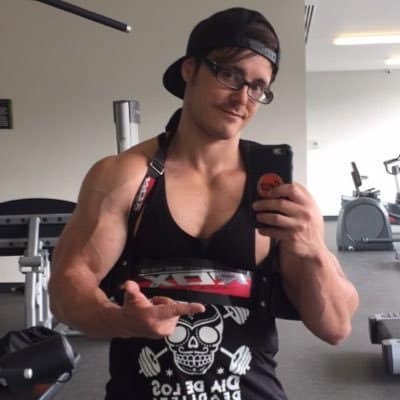 He is regarded as one of the most experienced, knowledgeable people in the low carb, keto community and is the go-to person for many people when applying the low carb diet to body-building. [01:09] – Luis explains the origins of his darthluiggi nickname and his involvement as moderator on the keto subreddit. [02:23] – Luis explains how he chose the ketogenic diet approach for strength training back in 2001 as he was an overweight kid and wanted to gain muscle while staying lean; rather than using the bulk and cut approach. Research showed keto could be the ideal way to achieve this. [06:34] – So, do we really need some carbs to grow and maintain muscle? Luis explains why this is a misconception as well as what other bodily processes protein is used for. To build muscle we need protein, the main building block, and an adequate training regime. [08:22] – Glycogen is important, but we don’t need carbs for this. Glycogen can be refilled by recycling of lactate acid as well as gluconeogenesis, which we shouldn’t be afraid of. For people on keto who are doing sport/strength training that doesn’t require a lot of intensity, there is no need to ingest carbs. [09:40] – For some sports, a targeted ketogenic approach may be necessary, where there is some glucose (5-80 grams depending on needs) added around training time. [11:52] – How is a fear of protein due to gluconeogenesis addressed when it comes to people who want to gain more muscle? Luis explains that most people on a ketogenic diet use a 70% fat, 20-25% protein, therapeutic approach developed for epilepsy. However, for overall health the focus should be on grams. He shares an easy way to calculate the starting point for protein, carbs and fat. [14:17] – Luis explains why people who want to lose weight on keto still need to be in caloric deficit. There is an initial, rapid weight loss followed by a plateau as we become more fat adapted. [18:41] – We discuss the keto carnivore diet movement. Luis explains that while eating too much is not bad, it’s not optimal. The law of diminishing returns applies in terms of improving body composition and there is a point where calories from protein would be better if they came from fat. Luis feels a high protein diet will also be more expensive. [21:10] – Luis prefers animal protein for building muscle as it is more optimal than the vegetable sources, which are not bio-available in the same way as animal proteins and lack some of the amino acids. While it is not impossible to build muscle using vegetable proteins, it is not the best way. At Ketogains they focus more on the paleo and ketogenic diets. [23:31] – Are protein shakes and bars useful for building muscle? While Luis is a fan on focusing on whole food, shakes are a good alternative, especially for people with smaller appetites. He emphasizes that the body absorbs and reacts to real food better. Food should be as close to what it is in its original form. [25:08] – For training and building muscle, is there an optimal time to take the protein? Luis explains why training while fasting is not optimal as you are breaking down muscle. After looking at studies, he recommends people have a whey shake (or breakfast) before training, as the protein would be hitting the bloodstream in one to two hours. [30:52] – If you are having a piece of meat before exercise rather than a whey shake have it 2hrs before (with a shake 20min is enough). A good rule of thumb Luis uses is not to let more than 4 hours pass between having some food and training. [32:23] – For people who struggle to eat in the morning Luis recommends the Ketogains pre-workout coffee (de-caffeinated if preferred); the evidence-based formula contains coffee, 25-30 g protein powder, 10-15g MCT powder, ~2g sodium and creatine (which is the only supplement they suggest). [34:37] – Most of the fat sources Luis prefers come from whole food sources, but he also uses coconut oil, ghee, MCT oil and is dairy free, himself. He explains that, while he is not against dairy, he recommends that people on a weight loss protocol avoid nuts and dairy. [35:59] – Luis shares his meal routine and explains that even though he is a big guy, he doesn’t need many calories because he is well fat adapted; 1800 calories on average even when strength training. The important thing is getting an adequate amount of food and that doesn’t always mean eating many meals. [37:31] – How to start introducing strength training for building muscle and general health. After training thousands of clients at Ketogains, the best formula they found for losing body fat is strength training (cardio seems to be the least efficient). Luis recommends people try their free program at home which uses a classic 5×5 method. [39:18] – For highly advanced individuals it is optimal to train 5-6 days a week, but for someone new to training 2-3 times a week is enough. As we get stronger we need to increase this amount so that we can increase the volume (sets by reps by weight lifted). [40:29] – Luis believes the Dr Doug McGuff Body by Science 15-20min workouts don’t provide optimal stimulus for the young and able. Might be good for people with health problems and older individuals. There is a difference between doing the minimal work for maintenance and the optimal for growth; he believes this is the minimal approach that gives minimal results. [41:15] – People on ketogenic diets sometimes report less delayed onset muscle soreness (DOMS). The more adapted you are to a certain type of training the less DOMS you will get – it is an adaptation process and has nothing to do with a good work out or strength training. People who are highly advanced in training rarely get DOMS. [42:40] – Are there any differences with strength training for women? For the most part, it’s not that different and women respond incredibly well, especially in terms of body decomposition, hormones, health, etc; Luis explains how women don’t have to be afraid that they will get bulky! A lot of their clients are women who never strength trained before and come from classic cardio training but are getting much better results now. [46:31] – The Ketogains community involves a lot of women (65-70%) over 35 and it is not a typical group for bodybuilders. Their scope is for people who want to improve their lifestyle and health. Gains are better body composition, health, cognition, improved performance and all aspects of life via ketogenic diet. [47:51] – To follow or contact Luis go to ketogains.com where you can find articles and other information. For more direct input and interaction go to the Ketogains Facebook group (where Luis is quite active) or their reddit group, where you can tag Luis and he will answer your question. The only thing he asks people is that they don’t send him personal emails or messages, the aim is to share advice in an open format where he can help as many people as possible. Luis also offers personal coaching and the Ketogains bootcamp which is a mini-course in nutrition, strength training and self-improvement that happens on a month to month basis and lasts seven weeks.